Ford's new Mustang diecast cars! Here's a great assortment of diecast Mustangs at great prices. These are top quality cars, you'll be proud to own. I just added lots of new models. Click on the blue links to check them out. The design for the 2005 model year was historic, both for the exciting new retro styled design, and the incredible return for all the Big Three automakers of the pony car, or factory muscle cars, including the Dodge Challenger and the Chevrolet Camaro. The 2004 Mustang GT concept car or as some call it the 2005 Mustang concept has caused a stir in the tuner and designer community too, including this take of the 2005 sensation, the 2005 Mustang Cesam in bright yellow. Check out the concept styled hood, with the addition of the newer 2005 front bumper fascia. Direct from Ford Racing. 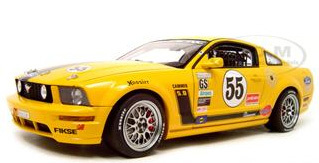 The 2005 Ford Racing Mustang FR500C in Grand Am Cup form. The ferocious 400 horsepower racer, with it's Mustang "Cammer" engine, has proven to be a formidable contender on the race track, with 13 wins, 38 appearances on the podium and 130 top ten finishes. 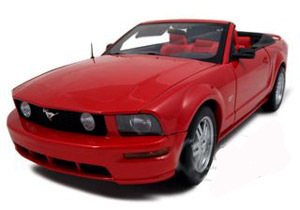 Here's your chance to own a beautiful, red 2005 Ford Mustang GT Convertible Diecast car. In 1/18 scale and crafted by Autoart. 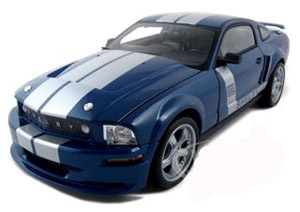 If your taste in the new Mustang runs to a fastback, here's a very high quality and detailed 2005 Ford Mustang GT crafted in 1/24 scale, by Franklin Mint. Short on space? here's another fastback 05 Mustang GT painted in Legend Lime. It's 1/43 scale. 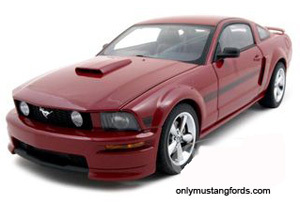 Here's a nice, inexpensive 2006 Mustang in 1/24 scale. Is that Grabber Orange ? Like your own cool 2006 Mustang GT Convertible ? Here's your chance to own one, in 1/18 scale. The true North American Supercar, the 2006 Shelby Mustang CS 6 , painted blue with matching white stripes and hockey stick side stripes is the perfect choice for the Shelby enthusiast. Nicely detailed and perfectly sized at 1/18 scale. Check out this awesome 2006 Shelby Mustang CS6. A very nice diecast 1/18 scale model, complete with twist lock hood locks and painted in black with silver racing stripes. New for 2012, is this beautiful bright yellow 2006 Ford Mustang GT Convertible diecast at 1/18 scale. 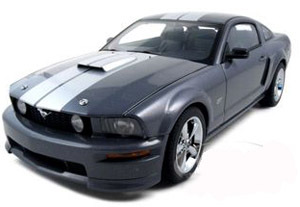 Check out this nice 1/18 scale 2007 Ford Mustang GT painted tungsten gray. A real "classy chassis". And with over 300 horsepower from that incredible Ford V8, it's something you could imagine showing up in your own driveway. I just had to show you this beautiful 2007 Shelby Mustang GT500. Painted sleek black, with silver racing stripes, it's available in 1/18 scale. If you've always wanted a 2007 Mustang California Special, here's your chance. Just like the original, it's a limited production car. Yours will be only one of 3,000 made. Not to worry, however, if your favorite color isn't white. Here's another high quality 2007 Ford Mustang GT California Special painted Fire Red. It's also a limited edition diecast Mustang with your being one of only 3,000 made. This 1/18 scale 2007 Shelby Mustang looks great in orange, with cool silver stripes. If your favorite Mustang is "enhanced" by Steve Saleen and company, then this beautiful 2007 Saleen S281 Mustang is for you. It's nicely detailed and crafted in 1/18 scale. Whether you're looking for more Mustang diecast cars or other Ford Mustang information, try the search box to find it quickly.